Grounded in liberal religious thought and history, Owen-Towle identifies 12 distinct attributes that are vital to all successful UU churches. Aimed at Sunday worshippers, lay leaders, religious professionals, and social justice activists alike, here is a visionary primer on what it means to do and be church the Unitarian Universalist way. A church is not a social club, a hospital wing, a political action center, or even a spiritual refuge, although all these disparate components are part of what a church is. 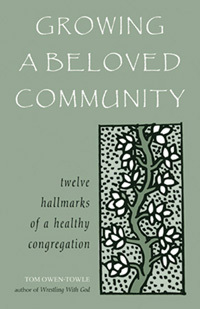 Rather, healthy congregations are primarily sites for seeking and spreading the holy, however variously referenced by Unitarian Universalist guides: “the deep way” by Unitarian religious educator Sophia Fahs; “the conditions for human transformation” by the Reverend Edward Frost; “centers of redemption” by the Reverend Ralph Stutzman; and “dealing with ultimate things” by the Reverend Barbara Pescan. Ecclesia is the Greek word for a regularly convoked assembly. It refers to folks being “called out” of their daily routines for a sacred purpose. Ecclesia is not an ethereal entity but a structured, grounded reality. Through church life we embody our holy quest. Ecclesia is a chosen kinship circle within which our convictions are refined and our commitments enfleshed. Ecclesia is holy ground. Much of the secular world, other religious denominations, and we Unitarian Universalists ourselves have characterized, if not caricatured, our free faith as every kind of psycho-social-political venture except a religious one. On the contrary, a healthy congregation broaches “serious things in a serious place,” in the words of Phillip Larkin, an English agnostic who thought the Anglican faith essentially irrelevant yet knew that churches should engage ultimate concerns—that they should be religious. And what does it mean to assert that healthy congregations are “holy”? It means we create an environment where minds are stimulated, hearts fortified, souls plumbed, consciences goaded, bodies embraced, and spirits restored. It means that we seek to serve whole human beings, acknowledging that the hallowed is present amid the ordinary and the commonplace. "Owen-Towle has? again?got his finger on the pulse of meaning that nourishes healthy congregations. A timely and thoughtful book." In celebrating the sacrament of community, Owen-Towle consecrates the faith he has served so long and well." This book is a wonderful tool for all who are working to make their UU congregations the best they can be. It is at once a road map, a “how to” manual and a great source of inspiration and uplift. Owen-Towle writes to the point and with great wisdom and warmth. There is something of value on every single page.